(December 19, 2012): Coming just days after releasing its 2013 event schedule, the Lucas Oil Regional Off Road Racing Series today announced new corporate partnerships with Polaris and Walker Evans Racing designed to launch a production- based UTV class for the growing, grassroots-based form of motorsports. 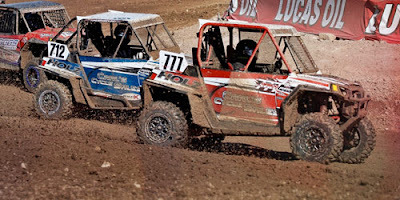 The newly created Stock RZR XP class will focus on budget-minded racers being able to compete in off-road short course racing using the high-performance, two-seat Polaris RZR XP 900 sport UTVs directly from the showroom floor. In order to enhance competition and keep costs down, the only modifications allowed will be mandatory safety cages and optional bolt-on performance items. For 2013 Lucas Oil welcomes both Polaris and Walker Evans Racing as sponsors of the Stock RZR XP class for the Southern California series. The new racing category, however, will be incorporated into all three of the Lucas Oil regional off-road series, including Arizona and Utah. Based just outside of Minneapolis in Medina, Minnesota, Polaris Industries is a world- wide leader in the manufacturing and sales of high-performance and utility ATVs, UTVs, snowmobiles and motorcycles. First launched in January of 2011, the Polaris RZR XP 900 quickly established new benchmarks of power and performance for a Side-by-Side UTV. Walker Evans Racing, located in Riverside, Calif., has been a longtime supplier of snowmobile and UTV shock absorbers to Polaris, as well as being a team owner and sponsor of championship-winning Polaris UTV efforts via driver R.J. Anderson. For 2013 the Lucas Oil Regional off-road racing program will consist of three separate regional series. The Southern California series presented by Kartek Off Road features three visits each to legendary Glen Helen Raceway in San Bernardino and the newly refurbished Lake Elsinore Motorsports Park in Lake Elsinore. The Arizona series will visit Speedworld in Surprise four times; the Firebird International Raceway in Chandler and a “double points” stop at Cocopah Speedway in Yuma. The Utah series will see five Lucas events all held at world-class Miller Motorsports Park near Salt Lake City.